Two 15-year-old girls, going to school at Central High in Little Rock, Arkansas, in September 1957. For Elizabeth, it was a monumental day that she and her family and neighbors had planned for months. It was the start of a new era, perhaps a new beginning that would bring the freedom and equality they had dreamed of. But it turned into a day of terror and pain that haunted her for the rest of her life. For Hazel, it was not that different from any other day. Wearing a mint-green dress that she hoped would impress the boys, her main concern at the time, she got caught up in the angry crowd out front, shouting hateful remarks at Elizabeth as she walked past. Her rage and hate would perhaps have been forgotten had a photographer (actually, several photographers) not been there to capture that moment. And so Hazel came to represent all the racism of the South, and she too became haunted by the events of that day. 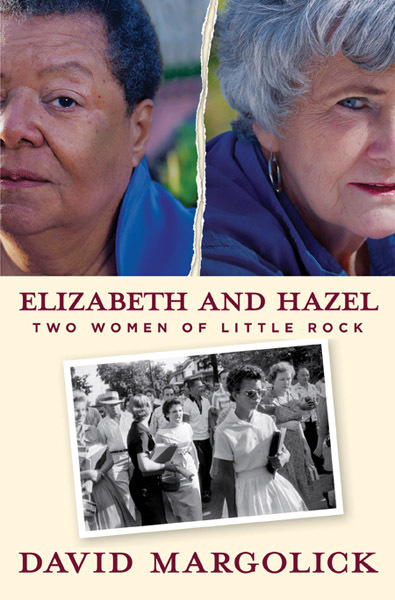 In Elizabeth and Hazel: Two Women of Little Rock, David Margolick tells the story of that September day when nine African-Americans who came to be known as the Little Rock Nine first attempted to begin their studies at Central High. His focus is on the two women—Elizabeth Eckford and Hazel Bryan Massery—whose photograph landed in newspapers around the world, depicting the rage of the white South and the dignified perseverance of African-Americans. Years later, the two women became friends, and their story came to mean hope for forgiveness and reconciliation, but as Margolick explains, misunderstandings and personality differences caused them to sever their relationship, revealing that for all the steps we make forward, we still have a long way to go. I won’t mince words but will say flat-out that this is an important book. It’s important not just for what it reveals about U.S. history, although that is significant, but also for what it reveals about the present and how difficult it is even today to discuss race in America. The story of these two women reveals just how uncomfortable we still are with our own history and how large the task of righting past wrongs still remains, especially when there’s disagreement over what righting a past wrong should look like. Margolick does not shy away from the difficulty, and neither does he provide answers or take sides (aside from his clear condemnation of the overtly racist actions of the past). He treats both women as individuals, even as he acknowledges how they are also symbols of our shared past and present and our hopes and fears for the future. He tells about what each experienced that September day and what each woman’s life was like in the succeeding years. Elizabeth’s time at Central High was difficult, with students shoving her in the hallways and yelling racist epithets after her. After leaving Central High, she attended college but didn’t finish, served in the Army, and returned to Little Rock, where she struggled with depression and poverty. It’s not the narrative we hope for when we think of the great Civil Rights pioneers. Hazel’s parents withdrew her from Central High after the photograph was published, fearing what her new-found notoriety would lead to. She married before finishing high school and later came to regret her actions. Perhaps hoping in some way to atone for her wrongs, she started reading books about black history, challenging family members who expressed racist sentiments, and working with underprivileged teens, most of whom were black. She even called Elizabeth in 1963 to apologize for her actions on that September day in 1957. Although Elizabeth accepted Hazel’s apology, the two women did not have any further contact until the 1990s, when they posed together for a photograph that some hoped would define a new epoch in race relations, one of reconciliation. The two soon became friends, going to flower shows together and appearing together at speaking engagements. Some people—white and black—were suspicious of Hazel’s motives, assuming that she was looking for attention. Elizabeth came to believe that Hazel was not fully acknowledging her own past wrongs. Hazel was confused about what precisely people expected of her and frustrated at their suspicion. One of the things Margolick does well here is give each woman’s version of events space and credence. He doesn’t spend time trying to pick apart who’s right and who’s wrong. He does point out discrepancies in their accounts and misunderstandings, but he lets readers draw their own conclusions. As a reader, I came away with the feeling that both women are right and both women are wrong. Both are carrying the baggage of the past, as we all are, and both are affected by it in different ways, as we all are. Both have misunderstood and been misunderstood. And both seem to grieve their lost friendship. I’d like to say that this is a hopeful story, but it isn’t. It broke my heart again and again. But I’m so glad I read it. This entry was posted in History, Nonfiction and tagged BEA Review Copy. Bookmark the permalink. Oh, I’m so glad you reviewed this one so quickly after I saw you reading it on GoodReads. It sounds fantastic, and I like that he doesn’t take sides- I don’t think I have a very positive view of Hazel after all I’ve heard about her, so it would be good to get her perspective. So glad you read this as I had never even heard of it. It was so unputdownable that I ended up reading the rest of it very quickly. I ended up feeling bad for Hazel. There was something of the “white savior” about her actions, which was troubling, but mostly she struck me as really naive about how deep the wounds of racism are and how it would be to get past them. I felt bad for Elizabeth too and could understand the reasons for her suspicion. Difficult stuff. This sounds like a really interesting book on a very volatile topic. I think I’ll put it on my list. I think you’d find it interesting Jenny. It’s such an unusual story, but it gets at so many tough issues. Your review is the first mention of this book that I’ve seen – and it does sound like a very important book, and a compelling one. I am putting it on my list as well (though I probably won’t get it before the TBR challenge starts up). It was just released this past fall, and I wish it had gotten more attention. I met the editor at BEA, which is where I got my copy, and I heard one story about it on NPR, but that’s about it. It’s a story that should be talked about. Thanks for this review, sounds fantastic. Adding it to my wishlist now. Sounds fantastic. I remember you picking this up at BEA. I didn’t. I should find it because it does sound very good. It is very good and a quick read as well. I thought this book looked really intriguing when I first heard about it, but tough. I’m not sure I’ll ever get to it although I’m sure it’s interesting and important. I know what you mean about not getting to everything. This is a quick read; it’s the issues it raises that are difficult. I saw this book reviewed on The Book Report, and now here, sounds like a must read. Is that The Book Report Radio Show by Elaine Charles? I am also hear because of that show. 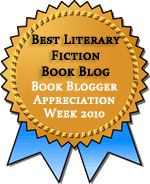 I listen to the archives on http://bookreportradio.com. I also listen to Elaine’s radio show! The part I like most is she plays a segment of most of the books she reviews. I liked the segment of “Elizabeth and Hazel: Two Women of Little Rock” by David Margolick in particular, I shall be adding this to my list.